You dont need to master croquet to learn this simple bit of ye olde English lifestyle lore: on a hot summers day or anytime thirst needs refreshing iced tea isthenice tea. Our medicated iced tea blends citrus and tea flavours with a well-balanced splash of sugar sweetness. Just add water and serve over ice. Ahhh. And our medicated, cannabis infused quencher comes through, with a consistent measured dose of THC. 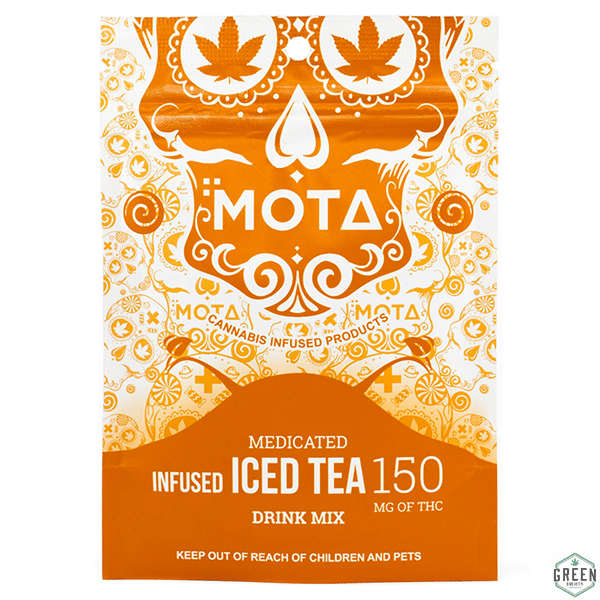 Happy Euphoric Stress Anxiety Depression Pain INGREDIENTS Sugar, Citric Acid, Cannabis, Tea Solids, Tri-Calcium Phosphate, Natural and Artificial Flavours STRENGTH 150mg THC WEIGHT 70 grams STRAIN Hybrid WARNING ADVISORY: Please be advised that Mota Iced Tea Mix is packed with a non-toxic silica gel packet to ensure no moisture content is present in the packaging. Please Ensure that the silica packet is removed before consumption.